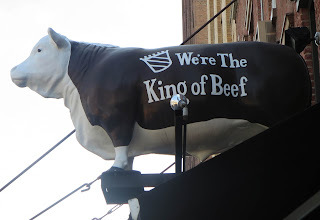 The most famous cow on the Manhattan skyline is more than 60 years old. It is Annabel the Caw that was installed in front of the post-Civil War eatery in 1953. Old Homestead Steakhouse, one of the longest continually operating restaurants in America and the longest running steakhouse in New York, was open in the heart of New York City’s Meatpacking District in 1868. As the name "Meatpacking District" suggests, two hundred years ago this part of Manhattan was an area where lots and lots of meat was stored, cut and dispatched. In fact you can still see some of the above-ground racks and hooks on which meat was hung and moved. Originally Old Homestead Steakhouse was named as Tidewater Trading Post. At that time the waters of the Hudson River washed up to its doors during high tide. It became a favorite of local residents and out-of-towners, mostly ladies and gentlemen of financial means. In the late 1890’s the name was changed to Old Homestead. It was the first restaurant to send patrons home with a doggy bag ( container for leftovers) because the portions were too big to finish there. According to the legend, in 1953, a Nebraskan farmer promised a cow to the owner, Harry Sherry of a steakhouse Old Homestead. The next year, the farmer dropped off the statue –Annabelle–in front of the restaurant. He trucked it across America on the back of his pickup truck. The statue stood on the sidewalk in front of the steak house . The owner needed to remove it , so he temporarily placed it on the marquee, where it has remained ever since. 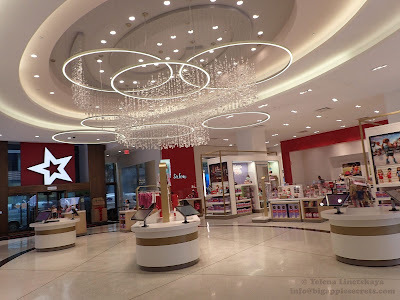 In 2011 Annabelle helped open a new location in Las Vegas but returned back. The Anabelle has served as the backdrop in 'Seinfeld,' 'Law and Order' and 'The Sopranos'. 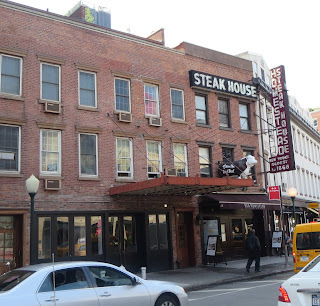 Sean Penn, Sylvester Stallone, Robert De Niro, Anderson Cooper, Francis Ford Coppola ate in this steakhouse. The Old Homestead has been owned and operated by the Sherry Family since 1940. Harry Sherry started out there as a dishwasher and later bought it from its former owner. Thanks to the efforts of the restaurant owners Greg and Marc Sherry, Wagyu (more commonly known as Kobe beef) was brought to America from Japan . Kobe beef is fed on barley and bathed with beer . There are very strict rules under which it is produced: only from one very particular breed, limited in age and size, only in the Hyogo prefecture, with specific feed and then strict grading, etc. 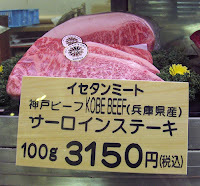 There are only 3000 head of certified Kobe Beef cattle in the world, and none are outside Japan. The process is so strict that when the beef is sold, either in stores or restaurants, it must carry the 10-digit identification number so customers know what particular Tajima-gyu cow it came from. On August 27, 2012 USDA updated its rules to allow the importation of Japanese beef, including Kobe, in very small amounts. 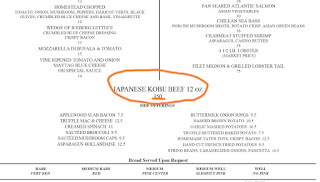 In practice, no Kobe beef was shipped to the US until November 2012 and even this small delivery was an anomaly, as no more would reach our shores until March 2013. The total amount of Kobe beef shipped to the US through the first 11 months of 2013 was just 3,217 pounds or less than 300 pounds per months for the entire country! 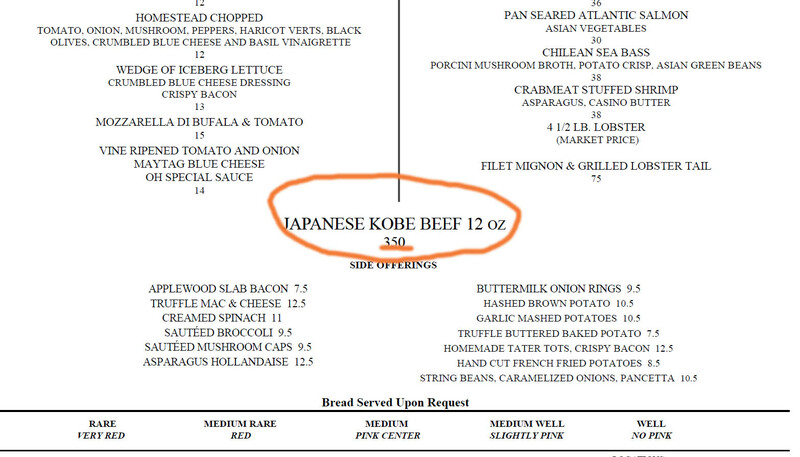 Old Homestead Steakhouse now serves 12-oz Kobe steak priced at $350. "Just imagine Fourth of July on your taste buds," Sherry, the owner, declares in a statement. "It’s a food experience of orgasmic proportions - really." If you cannot afford Kobe beef you can try New York sirloin 14OZ for $44.